Our goal is to get you into the equipment that you need with payments that you can afford. In step with this goal, we offer nationwide financing and lease programs on our entire inventory. We offer several types of financing to cover nearly every credit situation. Click on the Credit Application icon to download it. You will need Adobe Acrobat Reader to open the file. If you do not have Acrobat Reader on your system, you can download it for free by clicking on the icon below. 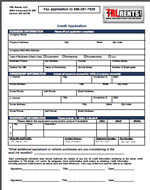 Once you have opened the credit application, please complete the information requested, print out a copy, sign it, and fax to 866.287.7829 or mail to 4884 Corporate St SW,Canton OH 44706. Don't hesitate to call us if you have any questions. Rent to Purchase? Why? You have nothing to lose and equity to gain. When to rent & when to buy….the 75% rule. Accountants, lawyers, managers and job Forman have struggled with this question for many years. When you take all of the emotion out of the debate and apply the math the answer becomes clear. The factors that must be considered are initial cost of the unit, depreciation, licenses, maintenance, liability of ownership, rental rate, down time (including cost of down time labor). After you consider all of these factors, the magic number is 75. If you will use a utility truck more than 75% of the time then you should buy. If you use the truck less than 75% of the time, you should rent. In using this method, you need to secure a solid relationship with a good rental house (Like Versalift East) who has a deep inventory so you may make one phone call and have what you need delivered to your door. The rental safety valve…how to use a rental truck to make your inventory more effective. Let’s start this with an example. ABC Electric owns 5 bucket trucks and 5 digger derricks in their fleet. They currently use these units 60% of the time (2,080 labor hours per year x 60% = 1,248 hours per year)...not too bad. ABC feels very good about their fleet, because they always have “What we need, when we need it”. ABC’s manager however is constantly struggling with divisional and job profit (really what he needs). He is hit with constant maintenance costs. His fleet is getting older and he is spending $1,000’s per month on tires, hydraulic hose repairs, brakes, annual inspections, dielectric tests, etc. He is paying whatever it takes to do the repair, because he knows that the repair cost is nothing compared to the cost of having 3 highly skilled linemen and a big job payout waiting on a broken down truck. ABC’s manager has been crunching some numbers, enduring too many “emergencies” and headaches. He is fed up and decides to ignore the critics and make a bold move. Here is what he does. Sell off the 7 worst units from his fleet. Keep the 2 best bucket trucks. His new fleet of 6 units = 3 buckets (1 new) and 3 diggers (2 new). 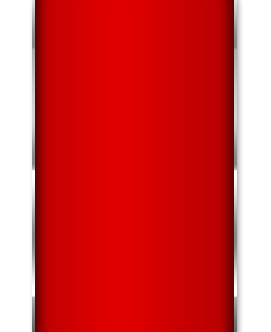 Plus the extended inventory or his “Rental safety valve”. When his utilization approaches 100% on his trucks, he drops a phone call to “The rental guy” to have a nice, shiny unit delivered to the jobsite. The maintenance, licenses, depreciation are not his problem. When the weather is bad or when he does not need the truck anymore…. the truck gets picked up and taken away to sit on someone else’s lot. Nearly 100% usage on the 3 new trucks (His guys are fighting over them). 95% plus usage on the 3 best used trucks (They need them all). 75% reduction in his maintenance costs (the 7 old maintenance hogs are gone and the 3 new trucks are under warranty). 10% increased efficiency on his jobs (His guys love having nice equipment and are not frustrated with down time). and most important… increased profit for the company. Now the manager of ABC Electric truly has “What he needs, when he needs it”…. the extra cash in his division to hire more good people. The critics have now all gone away to pick on someone easier. ABC’s manager is eating lunch with the owner and the CFO and discussing the addition a profit sharing structure to his salary. Bottom line…uses a mix of good fleet equipment and rentals to keep your equipment utilization in the 90% plus range and you will win. We at Versalift East can help you get there. Give Versalift East a call and they will get you started today with an analysis of your current inventory and a plan to get you where you want to be. 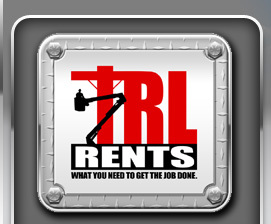 TRL Rents wants to help you win. If you need a piece of equipment and you are not sure if you will have continued work to keep it busy and at maximum efficiency, rental is a great option. The only down side to renting is that you are not gaining any equity for your equipment dollar. However, there is a win-win alternative: A Rent to Purchase (RPO). With the RPO, you can rent the equipment you need and still gain equity. In the event that you decide you have prolonged work for the unit, you can opt to purchase the rented unit and a generous portion of every rental dollar will be applied towards the purchase of that unit. Think about this: A rental is a full deductible expense. As you rent a unit and deduct your monthly payment, you then choose to purchase the truck. You will then have a portion of the total amount of rent applied towards the purchase… which is basically, non-taxable. Therefore you are getting a credit with non-taxable dollars.